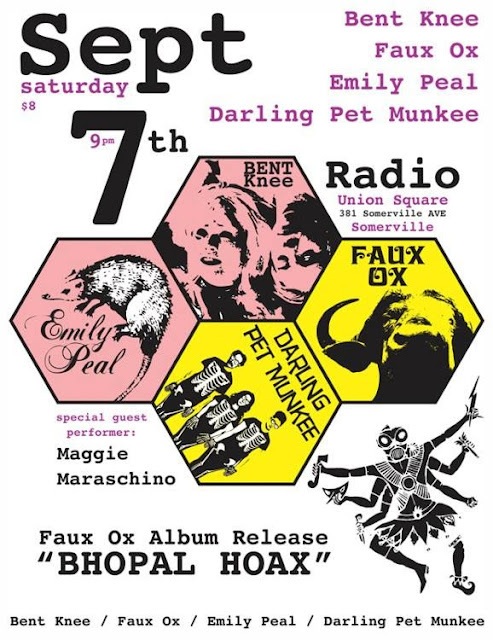 Darling Pet Munkee is opening the night of the FAUX OX CD release their sophomore effort, Bhopal Hoax! This is the last Munkee gig for 2013! Doors at 8:00 p.m. and show starts at 9:00 with Darling Pet Munkee at RADIO in Union Square, Somerville, Massachusetts. Previous PostMJEML to play Jamaica Plain Music Fest Saturday 9/7 3PM! Next PostMJEML is house band for The Encyclopedia Show Season 2! Starting 9/9/13 with DINOSAURS!